Blinds provide positive assurance of pipe, line, or duct isolation while eliminating the possibility of equipment damage, drops in pressure and leakage, personal injury, or worst, death. The dangers of blind conduits and electrical penetrations are obvious. Our Blind Penetration Tags clearly identify the location as well as the status of blinds, ensuring that these safety devices don't become hidden hazards. 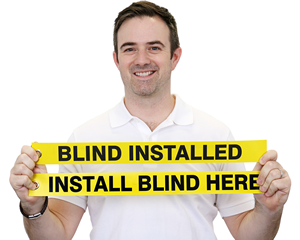 • Tags are used by contractors, municipalities and electric companies for their blind permit programs. Make sure that electrical hazards are identified and de-energized to avoid electrical accidents during wall or floor penetration. 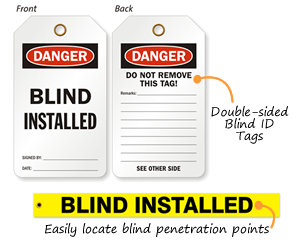 • Printed on both sides, blind penetration tags can be written on with pen or marker. • Tags are resistant to tearing, chemical spills, fading, and more. • Available in a range of durable plastic materials – all tags have a reinforcing eyelet that provides additional pull strength. Tags help locate safe blind penetration points.